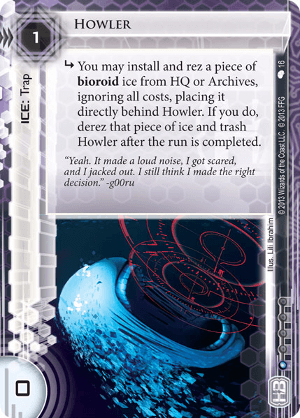 subroutine You may install and rez a piece of bioroid ice from HQ or Archives, ignoring all costs, placing it directly behind Howler. If you do, derez that piece of ice and trash Howler after the run is completed. Point is made as how Howler is not effective as a trap that forces the runner to encounter ICE and suffer damage. But I feel that's the wrong way to think about this card. This is an HB trap we're talking about, not Jinteki. This is how I plan to use this card: Say I'm trying to score an agenda while very low on credits. The runner feels confident that I can't rez anything that can keep her out so she runs the scoring server then boom surpise Wotan. This technique is also effective in protecting centrals from a crucial Account Siphon or The Maker's Eye run. Then there's its use for recursion and delaying the decision of where to commit the only strong ICE you currently have ("if the runner doesn't contest my scoring attempt now, i'd best have this ICE protecting R&D while I dig for the next agenda"). Howler especially shines, I think, in bioroid specialized HB identities like Stronger Together or Architects of Tomorrow. Usualy Howler is a Trap, that's easy to avoid. If triggered, it spawns an ICE directly behind it, but that's the problem: Between Howler and the spawned ICE the Runner can simply jack out and is done with it. I tried a little Double-Trap with a Whirlpool in front of the Howler. Keep a Janus or something else with high Damage-Potential in Hand or Archive and as long as the Runner has no fitting AI-Breaker, he can't avoid it. Unfortunatly this Trap usualy works only once and takes some Effort to set up, because the Ices need to be placed in the right order, you need to have the right Ice to load ready and it only works in a Meta where AI-Breaker are not played so often.